(CNN) – The Orlando Sentinel announced Thursday their endorsement of Republican nominee Mitt Romney in the 2012 presidential race. The Florida newspaper cited "anemic" economic growth and a growing poverty rate as reasons to throw their support behind the GOP candidate as opposed to President Barack Obama, which they did in 2008. "We have little confidence that Obama would be more successful managing the economy and the budget in the next four years. For that reason, though we endorsed him in 2008, we are recommending Romney in this race," reads the endorsement. In 2000, the paper endorsed Republican George W. Bush and then switched to support Democrat John Kerry in 2004. While handing Romney its support, the paper also conceded that the Republican White House hopeful is "not our ideal candidate for president." "We've been turned off by his appeals to social conservatives and immigration extremists. Like most presidential hopefuls, including Obama four years ago, Romney faces a steep learning curve on foreign policy," said the paper, alluding to Romney's stances taken during the Republican primary contests. "But the core of Romney's campaign platform, his five-point plan, at least shows he understands that reviving the economy and repairing the government's balance sheet are imperative – now, not four years in the future." The Orlando Sentinel said that despite unemployment rate falling below eight percent, in reflecting on the last four years, they believe Obama is not the most qualified candidate in the presidential race. 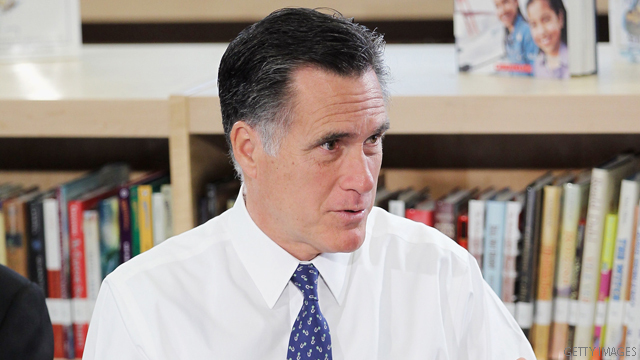 "This is Romney's time to lead, again. If he doesn't produce results – even with a hostile Senate – we'll be ready in 2016 to get behind someone else who will," said the paper. "We endorse Mitt Romney for president." Recent polls in Florida taken after the first presidential debate show Romney with an advantage over Obama in the battleground state among likely voters. An American Research Group poll released last week showed Romney at 49% and Obama at 46% support among likely voters. Another Florida poll showed Romney leading by a wider margin - 51% to Obama's 44% in a Tampa Bay Times/Bay News 9/Miami Herald survey also released last week. –CNN's Dana Davidsen contributed to this report. They make a good argument. Obama just can't get it done. We might as well let Romney go up to swing. They failed to take into account that Obama faced a hostile House and shaky Senate for the past two years. That slows things down in the agenda of getting people back to work. When it comes right down to the bottom line, you have to give up on the failed promises. Go Florida about time people and some news papers are not waiting for four more years of bad leader ship. If you think a national debt of 16 trillion is bad, try another 7 trillion on top of it. That is what Romney's tax cuts and increased military spending will do. Romney will need to cut spending by 7 trillion just to get back to the trillion-dollar deficit we have right now. If your house is on fire, stop pouring gasoline on it. What an awesome endorsement with "he's not our ideal candidate." They could have sat this one out. Oh , they also endorsed GW Bush in both elections . What did you expect , " Change " ? That's really great, as The Orlando Sentinel is A Prestigious News Paper. They know good quality when they see it. Does this mean that Florida turns red on pre-election electoral map now? Yes sir, Real Change is a coming! It has got to be bunch of staunch conservatives who run this newspaper who refuse to see the economic growth that is taking place in the country compared to shen G.W. Bush left office that many informed can see. By siding with Romney they are encouraging financial slavery to take over real growth of the middle class and the poor of the country. What do you expect from a bunch of right wing news guys. This is huge news. An endorsement in one of the most widely read papers in an important swing state does not bode well for Obama. The fact that the paper endorsed Obama four years ago is even more damaging. More and more people are realizing that this experiment has gone on long enough.